Ansonia Clock Co., Royal Bonn, "LaVinda", ca 1901. Another great rose colored case. 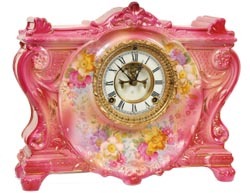 The flowers are inside a heart shaped circle around the dial. Many colors of small flowers from lavender, rose, yellow, and white. As usual there are the well placed gold highlights. The case is 11.5" high, 14.5" wide. Ly-Ansonia No. 2550.